As we are settling in to our new (old) home, I couldn’t help but take a stroll down memory lane and look at the photos of our first home. 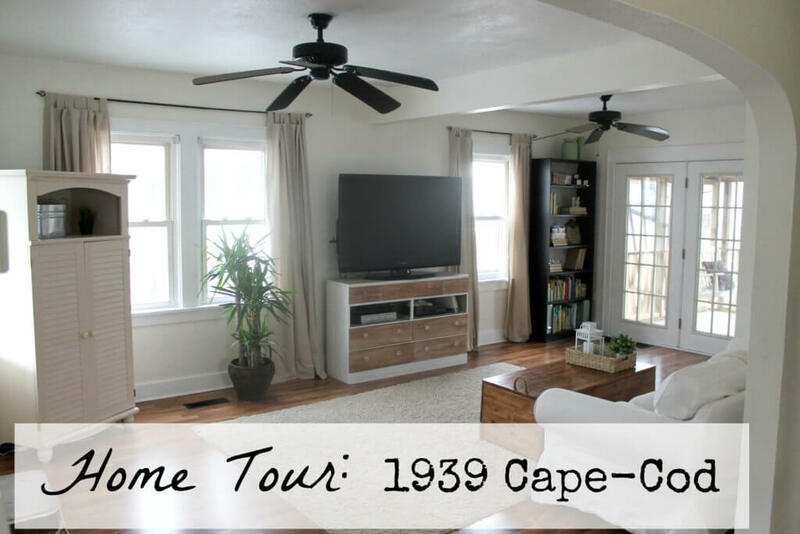 It was a 1939 cape-cod style house, and it was full of character. At a cozy 1,000 square feet, we used every inch of it. Over the years we made many improvements to the home, and I also noticed my style evolving as we went. Wanna see the good, the bad, and the ugly?! I think it goes to show that you can take any space, no matter how desperate it seems, and spiff it right up with some paint. As a newly married 22-year-old, you can imagine how tight my budget was. No magic here, just some strategy and elbow grease! Come on in! Yikes. To be fair, the first photo was on moving day, right after a rather sizable Ikea haul. My dear friend Laura and her husband came over to help us set things up. 🙂 Don’t you just love the gold color on the walls? Scrumptious. The middle photo shows our progress after a fresh coat of paint and new laminate flooring to replace the old carpet. This was back when I didn’t really have a defined style, and I thought color was the way to go. Don’t get me wrong, color is good, and I like the pops of blue, but it just never really felt like “me,” and it was still a somewhat dark room. Not to mention every room in the house had its own thing going on–do you see the lime green peeking in from the kitchen!? The last photo is how the home looked until we moved in March, 2015. 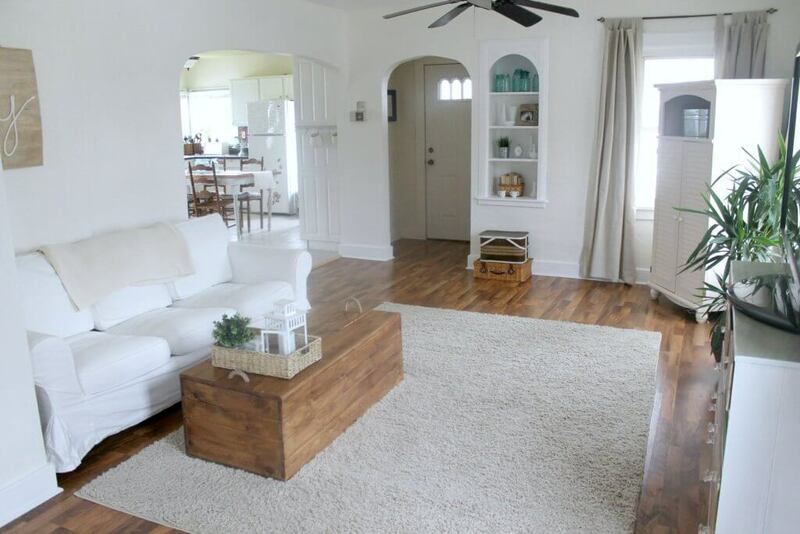 A new rug, couch, curtains and paint was all it took to completely transform the space. Next up on our tour is the Kitchen! When we first moved in, the kitchen was painted a dark burgundy with a–wait for it–rooster wallpaper border, as you can see in the first picture. You can also see my dear friend Laura again, this time helping me paint. Bless her. Our first step was to paint the kitchen lime green. And do you know what? I actually loved it and would do it again! Once I painted the kitchen cabinets a true white (instead of the creamy color) and we installed ceramic tiles, it really became a fresh, contemporary space. The problem? 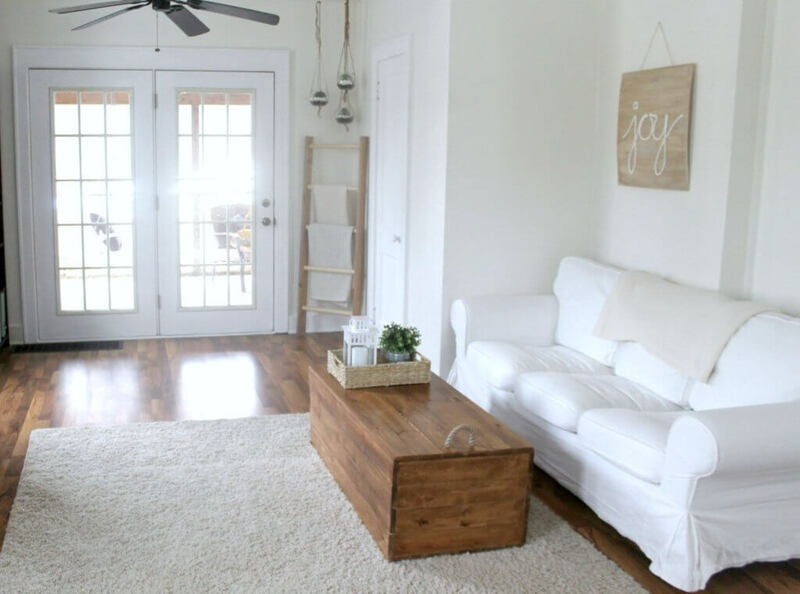 I finally realized that my style wasn’t contemporary at all, it was modern farmhouse. 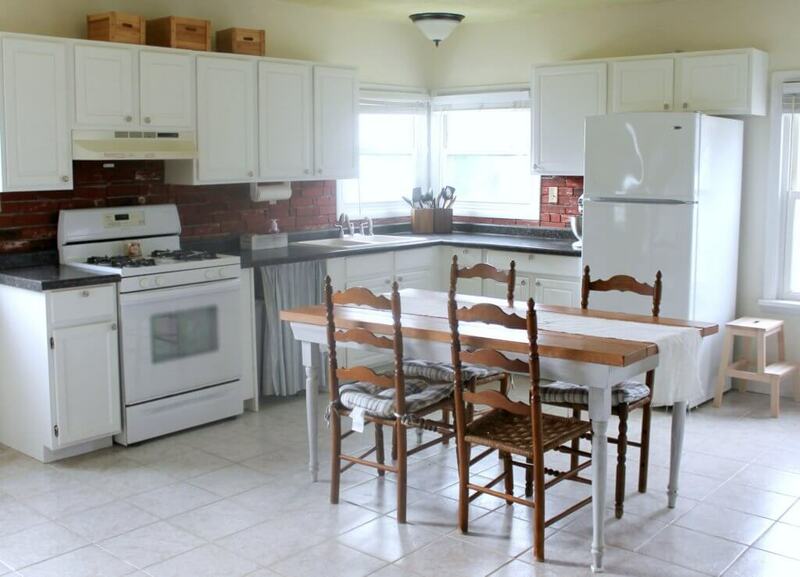 Also, every room in my small house with an open floor plan was painted an equally bold, clashing color. Whoops. A fresh coat of paint, some thrifted accessories and voila! The beautiful ladder-back chairs were actually my great-grandma’s. They went unused and sat in a barn for a long time before they were rediscovered. I loved being able to sit in chairs with such history! Would you believe that I actually pulled the table out of the trash? 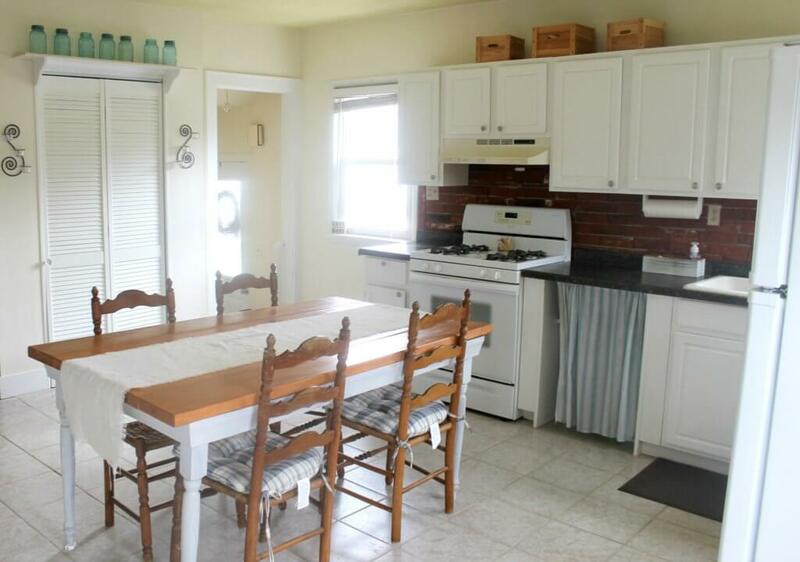 We ripped off the original top and replaced it with inexpensive 2x8s for a farmhouse feel. The next stop on our tour is the (very) humble bathroom. So. Small. And so outdated, complete with a yellow tub. I tried painting the walls a dramatic grey color, but the truth was that it needed a major overhaul. This was definitely our biggest home project and it was well worth it. Haha. This room! It is sooooo tiny but it certainly was a powerhouse. I don’t have a true before photo, because it was actually the same gold/brown color that the living room was before I painted it the blue shade you see in the first picture. When we first moved in, this room was our office and computer room. When I found out I was pregnant, we began changing it into a nursery for our daughter, as you can see in the middle photo. Adorable, right? There wasn’t even a closet so I hung a tension rod in a bookshelf and hung all her clothes there. I actually really liked the look of it. Unfortunately, due to extreme sleep issues, our child never actually slept in this room. But that’s a story for another day. 🙂 That’s when we decided to make it our bedroom and move her upstairs. 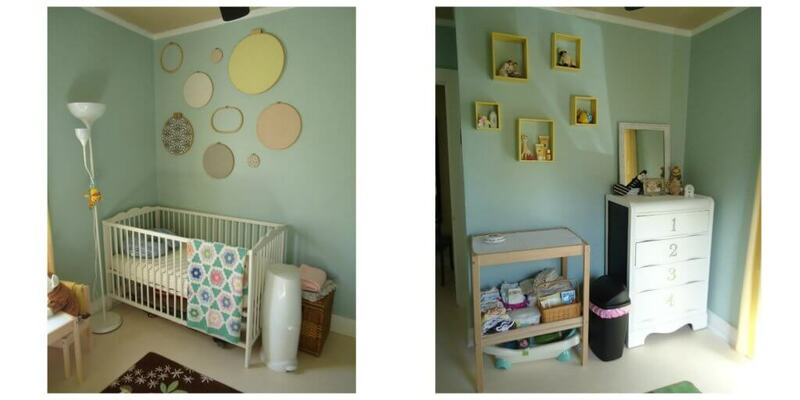 So here is what it looked like after a fresh coat of white paint and some DIY nursery style! You can find my gallery wall tutorial here. 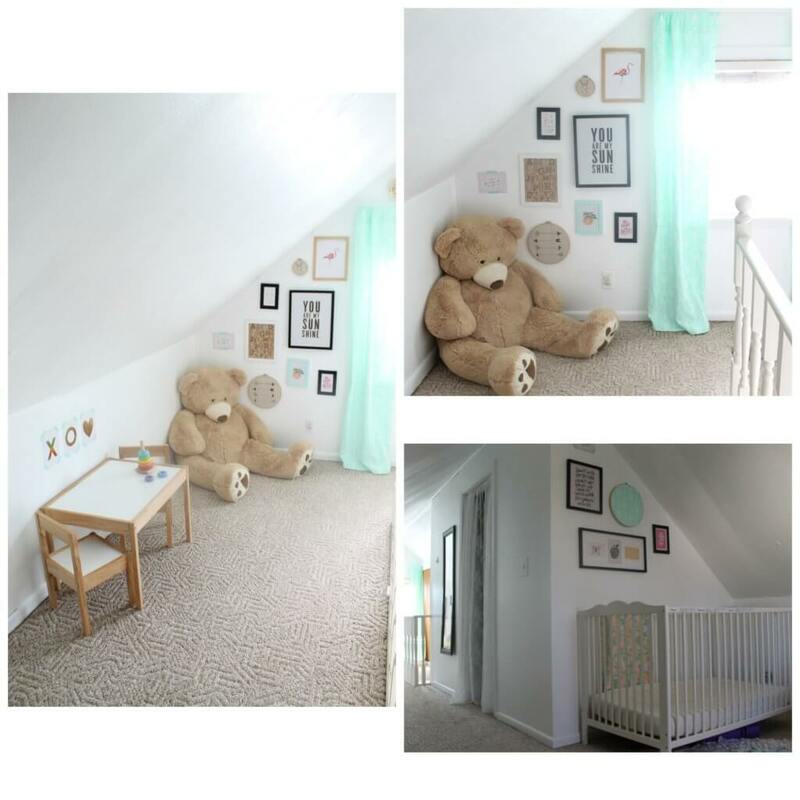 Honestly, this space just worked so well as her nursery. 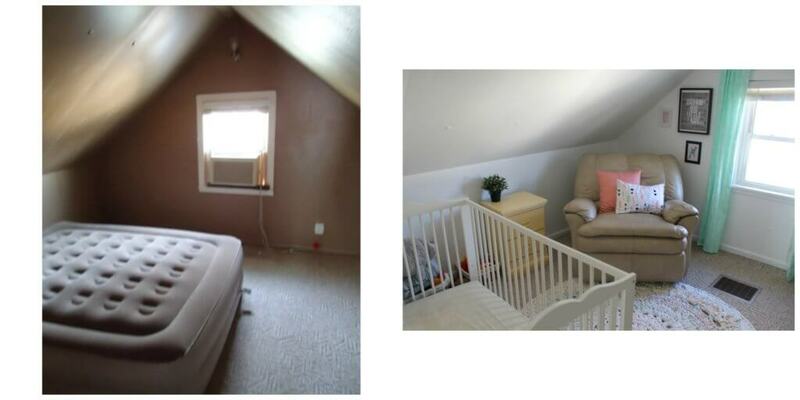 The low attic ceilings made it seem like some sort of magical child-sized room. I would have killed for a hideaway like this when I was little! So there you have it guys! The evolution and tour of our first home! While the new house we just moved to is (a dream come true) much larger, I loved every minute of living in our cozy Cape-Cod home. 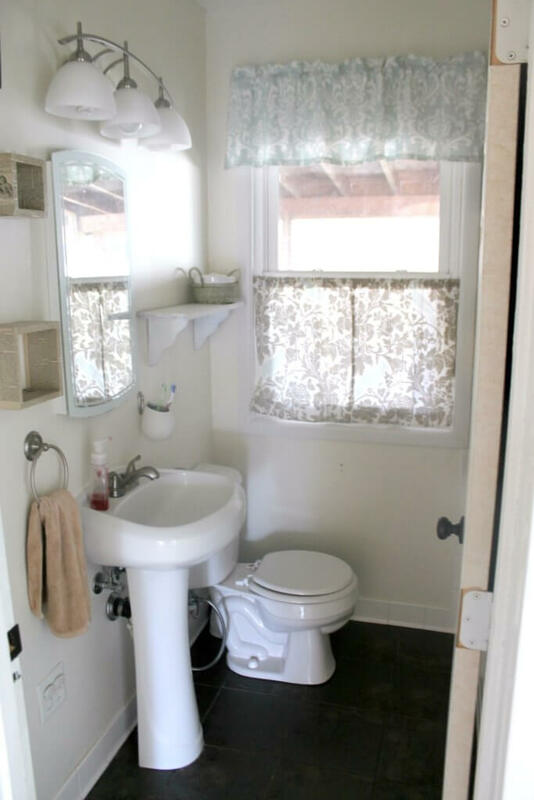 It was a perfect starter home for us, and taught me so much about utilizing every square inch of space. Have you guys ever looked back at the way your style evolves over time? Isn’t it fascinating?! And at The Creative Gallery here!